In the two days since the Mosul campaign officially restarted there has not been much movement. On the first day the Quds neighborhood in east Mosul was freed for the fourth time. On the second day a pharmaceutical plant in Bawiza outside of the Mosul to the north was liberated, and the Iraqi Forces (ISF) were trying to secure the Mosul-Tal Skurf road. The new plan is to attempt a double pincer move with army and police pushing from the north and south meeting with the Special Forces Golden Division in the center. So far the ISF have only been trying to secure areas that they have already freed or entered before. On December 30 there was fighting Hadbaa in the north, Palestine, Intisar, Salam, Nassir, and Shaimaa in the southeast, and Quds and Karama in the center, while other units were trying to secure the areas they had already freed. The Islamic State counter attacked in Sukar, Falah, and Hadbaa in the north, Tamim in the center, and Nassir and Wahda in the southeast. In the process four suicide bombers were killed, and twenty-six car bombs were destroyed. Again, all of these areas have been fought over in the last two months. 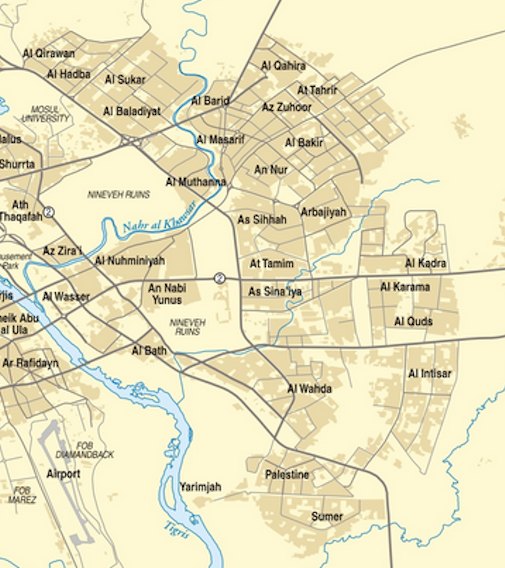 The Iraqi press reported that the Islamic State was pulling its families out of the city and sending them west. Similar stories have been published since the start of the battle for Mosul in October to show that the insurgents were collapsing. The fight they’ve put up so far has shown that hasn’t happened yet. The Associated Press and the Los Angeles Times both had a pieces on the difficult job the security forces have screening people for Islamic State members and sympathizers. AP talked with a man from IS occupied west Mosul who was caught in east Mosul. The ISF thought he was an IS member and beat him to try to get him to confess. Other people complained that the government forces were not letting them return to liberated areas. The Los Angeles Times on the other hand observed the courts that have been set up to process people. Everyone claimed that they were innocent, but if a person testified against someone they were automatically sent to a criminal court. The judges hear dozens and dozens of cases each day. This is a very difficult process that can take a long time. There are some abuses going on, and some IS members are being missed, but it is necessary. Finally, a Kurdish official complained again about being overwhelmed with casualties. Many of the ISF and civilian casualties from the Mosul campaign have been sent to hospitals in Irbil. Those facilities are running out of space and medicine for all of the people they are seeing. The Kurdish Health Minister Rekawt Hama Rashid said that over 13,500 have been treated so far, and they can’t take anymore. With only about 25% of Mosul occupied Irbil will have to make do or more hospitals will have to be opened because there is a lot more fighting laying ahead.